Mayor Jenny Durkan and Councilmember M. Lorena González also want to increase penalties for people who fail to report lost and stolen guns. 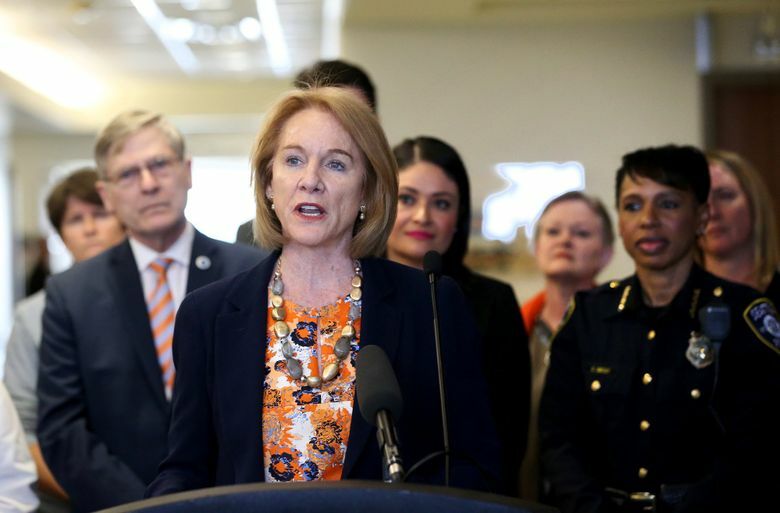 Seattle Mayor Jenny Durkan and Councilmember M. Lorena González said Wednesday that they plan to propose legislation to require gun owners to lock up firearms left in their homes and vehicles. The legislation also could increase penalties for people who fail to report lost and stolen guns, they said, describing the move as a response to a widespread gun-violence crisis and to shootings in Seattle. Many shootings happen with guns that weren’t properly secured, the officials said. Across the country, nearly 1,300 children die from gunshot wounds each year, Durkan’s office said. In 2015, an estimated 150,000 adults in King County reported keeping a firearm unlocked, the mayor’s office added. And in Seattle, 250 guns were reported as stolen in burglaries and car prowls in 2017, according to the Seattle Police Department. “We should not pretend for one minute that the level of carnage that we are seeing in our country is inevitable, is normal,” Durkan said. The safe-storage legislation has yet to be written, and the officials said they have yet to decide exactly how it would be enforced. They said they plan to work out the details over the coming months in consultation with gun owners, safety advocates, public-health experts and others. González noted she grew up in a rural Washington home where her father kept his guns locked and said she expects the legislation to reduce accidental shootings and gun suicides among children. State law prohibits Washington cities from regulating guns, and Durkan said she expects the legislation would be challenged in court. The mayor said she’s confident the city would prevail because the legislation wouldn’t stop anyone from buying, carrying or transporting a gun. “This is not an anti-gun measure. This is a gun-safety measure,” Durkan said. Some cities outside Washington, such as San Francisco and Los Angeles, have laws that require gun storage. Dave Workman, spokesman for the Citizens Committee for the Right to Bear Arms, said the Bellevue-based organization is still letting Seattle’s proposal sink in. The committee is affiliated with the Second Amendment Foundation. “There’s not a lot of wiggle room” in state law for cities to enact measures related to guns, Workman said. Seattle already requires gun owners to report lost and stolen firearms within 24 hours. Currently, breaking that law is a civil infraction punishable by a fine of up to $500. Durkan and González made the announcement alongside City Attorney Pete Holmes at Harborview Medical Center, where the city has been helping to fund a gun-violence research and intervention program. The program provides some gunshot survivors with services ranging from substance-abuse and mental-health treatment to employment assistance, based on research showing survivors are more likely to be shot again. Revenue from Seattle’s tax on the sale of guns and ammunition, adopted in 2015, is designated to support the research and intervention program. The National Rifle Association and others sued Seattle over the tax, arguing the city was regulating guns in violation of state law. But the city won the case, Holmes noted. “Not everything is pre-empted,” the city attorney said, vowing to work with the mayor and council to defend the safe-storage legislation. Durkan took part in a town-hall meeting at Chief Sealth High School this month to talk about curbing gun violence. There were 88 shootings in Seattle last year, killing 18 people, according to the Police Department. In 2016, there were 61 nonfatal and 11 fatal shootings and in 2015, there were 72 nonfatal and 16 fatal shootings. Last year, there were 360 reports of shots fired in Seattle, according to the Police Department. There were 150 in the South Precinct, more than twice as many as in any other. Some of the highest concentrations of shots-fired reports were in the South Park, Rainier Beach and Rainier View neighborhoods. At Harborview Wednesday, Durkan mentioned the fatal shooting of a 16-year-old last month in South Park and the shooting of a 15-year-old girl this month in Leschi. Besides seeking new gun-safety measures, Seattle is trying to protect people by using tools already on the books, the mayor said. Those include Extreme Risk Protection Orders, which were approved by Washington voters in 2016 by state initiative. The orders allow family members and law-enforcement agencies to ask a judge to temporarily limit someone’s access to guns based on evidence the person is a danger to themselves or others. In Seattle, 18 such orders have allowed for the recovery of 37 weapons, said interim Police Chief Carmen Best. King County has a program that educates gun owners about safe storage and connects them with storage-device discounts.